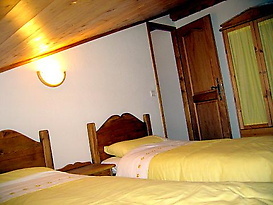 This self-catering apartment, built in 2002, in traditional alpine chalet style is situated on the first floor on two levels. The first floor comprises an open plan lounge, dining room and fully equipped kitchen with fridge/freezer, oven, hob and dishwasher; master double bedroom with en suite shower, basin and WC; main bathroom with full size bath and overhead shower; and separate WC. Patio doors give access to a large south west facing private balcony overlooking the Men's World Cup Downhill piste and with panoramic views of the Mont Blanc range. 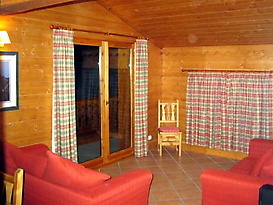 The upper floor has a second bedroom with two single beds and a third bedroom is an enclosed mezzanine with double bed. 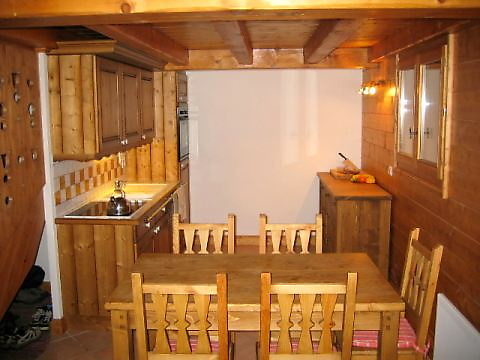 The apartment has private underground parking and at the end of a day on the slopes it is possible to ski to the door of the apartment and safely store your equipment in a private ski and boot locker. Local shops, restaurants and ski lifts are within two minutes walk, and you can ski back to within 100 meters of the door. The Chamonix bus-stop is a minute’s walk. Chamonix center is 5-10 mins drive. Linen, bath towels, electricity and local taxes are included. We ask a 300 euros security deposit returned to you on check out. This self-catered ski apartment, great for up to 6 guests, offers fantastic facilities for you to make the most of your skiing holidays. Find more information below.